How Can A Consultation Help? As we all start to indulge over the festive season, it is good to know that there are some healthy choices out there. Many of the foods we eat at parties and on Christmas Day have significant nutritious value; it’s a question of knowing what to look for. 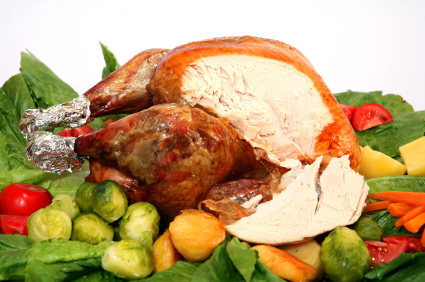 Turkey –This Christmas staple is a highly nutritious choice of meat; a low fat source of protein, which is rich in the essential amino acid tryptophan; vital to create the feel-good neurotransmitter serotonin. Brussels sprouts –Love them or loath them, sprouts are a rich source of nutrients including Vitamin C and folate. 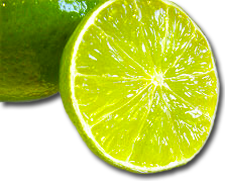 They also contain powerful phytonutrients, which support the body’s detoxification enzymes, helping to clear potentially carcinogenic substances from the liver more quickly. 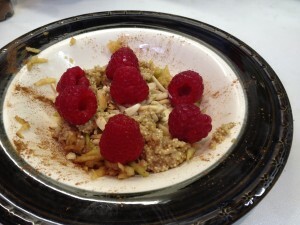 The trick is not not overcook them – and try serving with almond flakes. 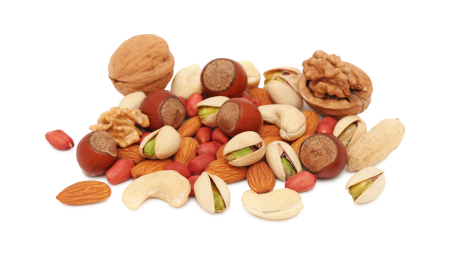 Nuts – A great protein snack to help you manage your blood sugar levels, and packed full of the essential fats, missing from so many of our modern day diets. 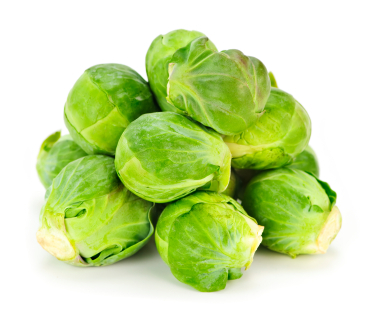 They are also packed with vitamins, minerals and fibre so make an excellent snack at Christmas time, so long as they’re not the roasted or salted versions! Festive Fruits – Whether it is a bowl of juicy Clementine’s or some bright festive berries such as cranberries, blueberries and redcurrants; this is a perfect time to make sure your intake of immune-boosting nutrients, particularly vitamin C, is at an optimum level. Brightly coloured fruits are packed full of antioxidants and so are an excellent addition to a festive diet. 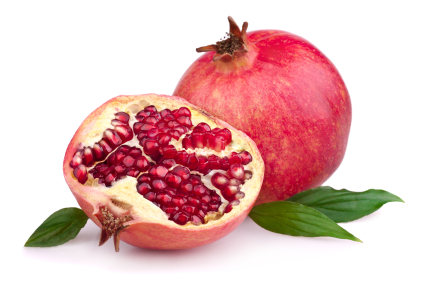 Pomegranate – With their bright red, almost jewel-like seeds, pomegranates are fast becoming renowned as a superfood for their nutrient value too. They score even higher then blueberries on the antioxidant scale, ORAC; in particular they are known to contain powerful polyphenols, which act in the body to protect against cell damage. 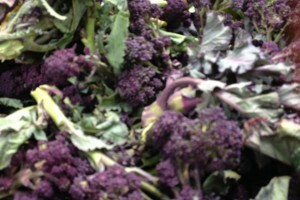 Delicious added to salads or to blend into fruit juices. 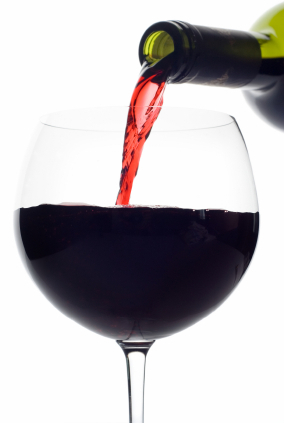 Red Wine – Research has shown that red wine, when consumed in moderation, can offer significant health benefits which can be attributed to the polyphenolic compounds present in grape skins; namely resveratrol. Adding cinnamon, spices, cloves & orange juice to make a warming mulled wine is a lovely festive option! Dark Chocolate – Choose the intensely dark varieties and as well as your sweet treat, you’ll also get a powerful punch of antioxidant-rich compounds, magnesium and copper. Ideally look out for a chocolate treat that contains at least 70% cocoa solids. 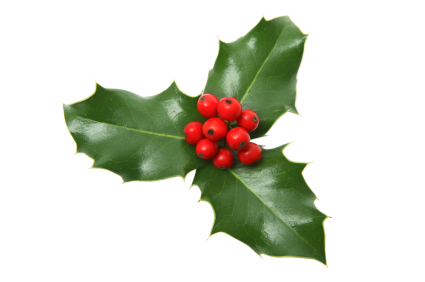 Wishing you a Healthy and Happy Christmas and New Year! Day 4, and so far things seem to be going well. Admittedly this programme has taken a degree of planning and preparation, but thank goodness for great health food shops in Brighton & Hove! Infinity Foods makes life so much easier and local grocers and supermarkets are now also stocking much more variety when it comes to alternative flours and unusual vegetables, so it’s more a question of being organised! 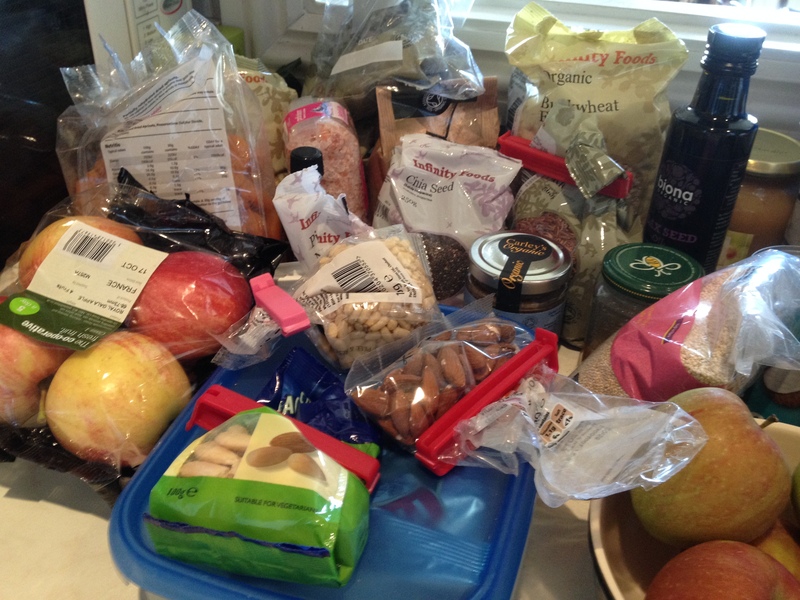 My kitchen has transformed into a healthy mini-mart, but a good distraction for the weekend could be a kitchen cupboard clear out. This isn’t intended as a weight management exercise, but my clothes are definitely feeling looser, which is very motivating. More importantly, I have been sleeping very deeply, my mind feels clearer and I’m waking up quickly and with plenty of energy, so I seem to be getting through so much more during the day. The other challenge is planning meals whilst away from home – a reality for most of us face on a regular basis, and one of my biggest this week. Again pre-planning so the key here. Work out where you are likely to be, and the options you will have available. If eating out in a restaurant, it is usually possible to look at the menu online before you go. This helps your brain engage with the choices you want to make and helps avoid making hasty bad decisions when faced with the waiter and his notebook. When heading out for a day’s work, take prepared food and snacks to avoid the temptation of the local sandwich shop or garage. The foods, meals and supplements we are working have all been carefully selected to support the liver and gut with their natural processes of removing waste matter and toxins from the body. If these aren’t efficiently removed they can cause all sorts of problems such as IBS, bloating, PMS and a range of other hormone-associated complaints; so this really is the basis of achieving good health. As for today; lunch will be an avocado salad (full of essential fats and Vitamin E) and tonight I’m aiming for something creative using chicken. If you have any detox recipes you would like to share, send them through and I will post my favourite on my recipe page. 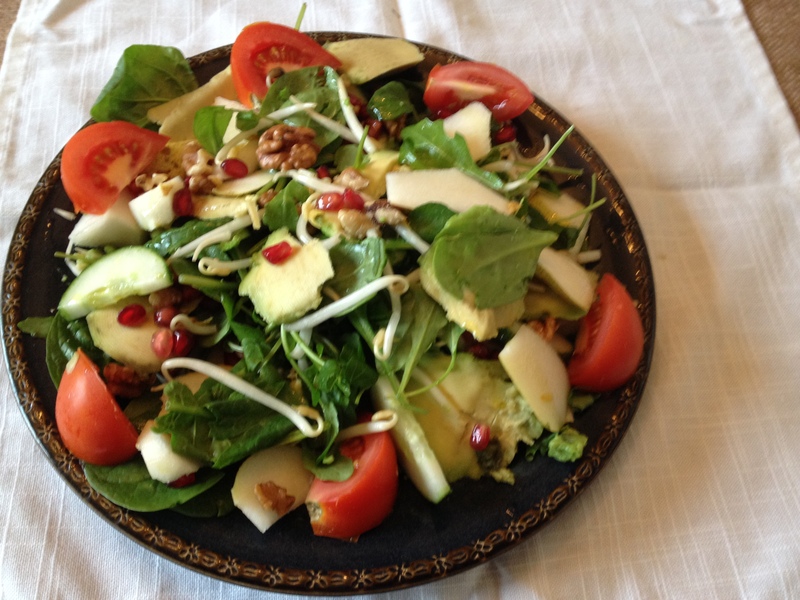 A mix of spinach, rocket and watercress; sliced avocado, tomatoes, bean sprouts, sliced pear, walnuts and pomegranate seeds; all drizzled with flax seed oil. Slightly off-menu but it worked for me! There was a fascinating insight into the world of dieting this week with the start of a new series on BBC2 which reinforced all my beliefs that fad diets just don’t work. Whilst some of the failure statistics the presenter quoted may be under debate on today’s blogs and forums, the over-riding message that came across was that the concept of the modern day ‘diet’ is an industry fuelled by commercial enterprises with much charisma and a desire for large profit margins. Most honest of all was the former Financial Director of WeightWatchers who admitted that the reason the industry is so profitable is because, on the whole, the commercial diets tend to fail, so people return, spend more money and try again. It was also fascinating to hear that the industry effectively began back in the US when a statistician for a big insurance company re-defined the parameters of ‘healthy weight’, and in doing so, re-classified a huge proportion of possibly healthy Americans as being overweight. This was latched on to by the US Government and medical institutions, creating a perfect breeding ground for companies hoping to thrive on the guilt and worries of the population and create a solution to this new-found national neurosis. We undoubtedly have a growing obesity problem, not just in the UK, but worldwide, with the World Health Organisation now saying that obesity is a great problem than starvation globally. So is there a role for ‘diets’ or should we be looking for other solutions? Firstly, I prefer to use the term weight management. The words ‘diet’ and ‘weight loss’ imply deprivation, which automatically triggers a mindset of failure. Surely it’s better to embark on something positive and achievable which gives you lasting, healthy and sustainable results? Each person should be treated as a unique individual, recognising that weight issues can be caused by a variety of reasons, so it is too simplistic to say that merely eating less is the solution. If that were the case everyone would achieve their targets and we wouldn’t have a national crisis! For some it could be related to medical issues which need to be understood and addressed, such as adrenal insufficiency, thyroid problems, stress or prescription medication. For others, previous experiences and psychological issues can be the root cause. How many of us were told as a child ‘Eat up – there are children starving in Ethiopia’? These childhood habits can stick and cause immense harm. Social factors also need to be looked at; in particular the way we now have constant access to convenience foods 24/7. We eat on the run, and eat mindlessly with little thought or understanding about what or how much we put in our mouths. Combine all these factors and you can see the problem. A lucky few might have the wherewithal to change their habits with little apparent effort and hit their goals on their own. However, there are many people who simply don’t have the know-how to unravel all these elements and get back on track. For them, a structured plan can be useful and group programmes also have their benefits since peer support and encouragement will always help promote success. These things can be hard to achieve on your own! Rather than crazy fads, what we need are realistic and achievable ‘health’ programmes which offer long term re-programming of habits without doing anything extreme and harmful which will pile the pounds back on further down the line and leave a frustrating sense of failure. Ideally this should combine a medical overview to understand why weight might be increasing; education to learn how each food group is vital for health and wellbeing. 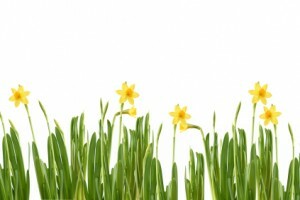 For some, a group dynamic can help provide additional peer-group encouragement; also psychological support and motivational coaching can help explain habits and overcome barriers to success; but finally expert guidance is vital to develop new healthy habits which become a natural part of daily routine around real life which includes holidays, meals out, birthdays and festive meals. The secret is to learn a few healthy habits, relax around food, and most importantly discover how to enjoy it again. So pack away those meal replacements, pills and extreme diet books and take a new approach. Focus on eating lots of the good and tasty stuff rather than obsessing about what you ‘can’t and ‘shouldn’t eat. 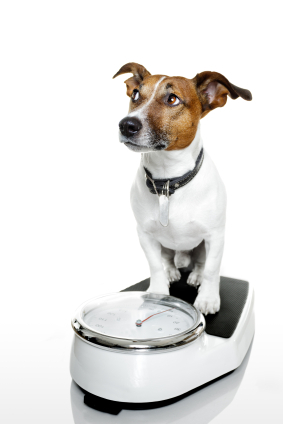 Our practical and realistic weight management programme offers a unique approach combining my qualified nutritional support and advice, with motivational coaching and hypnotherapy provided by Marco from OpenMindz to offer the additional techniques which will help you reach your goals. The next 6 week Brighton and Hove Weight Management course starts on Tuesday 1 October in Preston Park, offering a small but supportive group environment. We know it works, so come and join us! 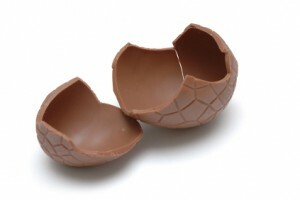 Easter can present an enormous challenge for anyone who loves chocolate but is struggling with a dairy intolerance or allergy; and this can be particularly distressing when children are involved. Everywhere we look, chocolate is tempting us, and it can be hard to say no to a small child when faced with Easter egg hunts at nursery school, supermarket shelves laden with goodies, and well-meaning visitors bearing chocolaty gifts. The good news is that there are dairy free alternatives to be found in Brighton & Hove – you just need to know where to look. Moo Free do a fabulous range including a dairy free chocolate egg and also a bunny bar; both of which are also lactose free. Check their website for stockists but they are available in some branches of Waitrose. Montezuma’s have a mini egg range which is vegan and dairy free, and some Sainsbury’s and Holland and Barrett stores stock the Choices range of Celtic Chocolates which are egg and dairy free. 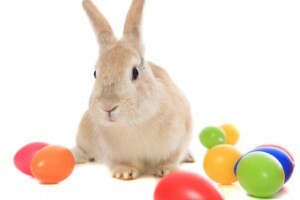 So if you, or your child, are following a strict dairy or lactose free regime; there’s no need to miss out this Easter. For everyone else, remember that dark chocolate is a better choice than lighter versions which are full of fat and sugar. Dark chocolate contains compounds called flavonoids which have anti-inflammatory and antioxidant properties so can help prevent heart disease. 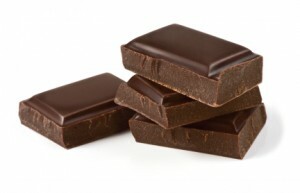 Eating dark chocolate also helps stimulate endorphins, or feel good hormones, which can lift your mood. This is thought to be because cocoa contains serotonin which acts an anti-depressant. But remember that chocolate of any kind also contains a large number of calories – so everything in moderation if you are watching your weight! Far better to reach for the Green & Black’s mini bars than the large slabs on offer at the newsagent’s desk! 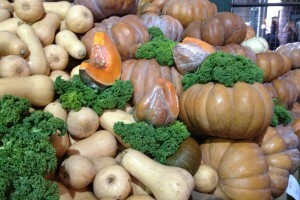 The delights and temptations of market shopping. 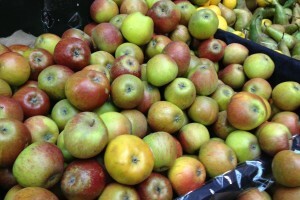 I was reminded of the joys of fresh produce on a visit to Borough Market in London at the weekend. Having only ever walked past it when closed, curiosity got the better of me and we finally made the effort to make a trip, coming away with a bag full of treats – all healthy and delicious. The sights and smells which hit you there remind me of the adage that we eat with our eyes; and having been seduced by a feast of colour, that was certainly the case. Digestion literally begins when we see foods and then smell them, and this stimulates the secretion of pancreatic enzymes to support the digestive process. As well as being great fun, market shopping can be a significantly cheaper way of buying your fresh fruit and vegetables, with the added bonus of no wasteful packaging. The produce is usually locally sourced and tastier than you are likely to find in most supermarkets, and it was noticeable that only seasonal produce seemed to be available, so it’s a great way of supporting your local farmers to survive against the multiples. The only downside to ‘budget’ market shopping is the temptation of the treats which weren’t on your list but the ever-persuasive traders draw you towards. The mushroom pate was divine and so far this week has adorned a jacket potato and stuffed a chicken breast; and the Vietnamese chicken curry was mouthwatering. Fresh spices were abundant offering an array of amazing ingredients for my next curry. Turmeric (or ‘poor man’s saffron’) is one of the healthiest spices available, containing curcurmin – a powerful chemical which has anti-oxidative and anti-inflammatory properties; great for supporting arthritis and allergies,and fantastic when added to basmati rice with pine nuts, onions and raisins to make fragrant rice. As for the L’Ubracio ‘Drunken Cheeses’ soaked in Italian merlot and cabernet wines, well – all in the cause of vital research! Local Sussex traders were well represented. Sussex Fish from Seaford had some beautiful fresh cod, sole and pollock – all caught sustainably off the south coast; but Flax Farm Linseed Whole Foods from Horsham won the day with their FlaxJacks ®; all wheat free and some even gluten free, using quinoa and millet instead of oats – a real treat for the Coeliacs amongst you. Next time you are in London with some time to spare, go and visit Borough Market to savour the sites and scents, and in the meantime try exploring your local farmers market to see what there is to tempt you. If you are celebrating the Jubilee this weekend but worried about ruining your healthy eating regime, there are tasty snacks and nibbles you can make quickly and simply which will still grace a party table, contribute to your daily fruit and vegetable quota, and provide a great alternative to the fatal temptations of cakes, crisps and pastries. 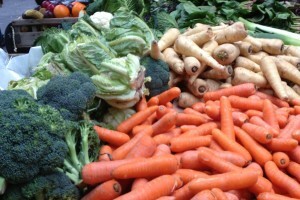 Chopped vegetables are packed with nutritious vitamins, and eaten raw can be a great fibre boost. Carrots, celery and sweet peppers make terrific dips and roasted vegetable kebabs go well with a barbecue. Try roasting chopped peppers, aubergine, tomato, mushrooms and courgettes and then skewer with some leafy herbs (basil leaves work well) to add colour to your plate. 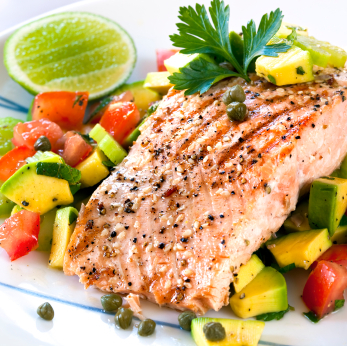 Instead of red meat, don’t forget salmon is a great source of both protein and essential ‘good’ fats. Smoked salmon is very versatile and can be rolled and added to vegetable kebabs, or added to mini toasts or wholemeal bread squares to make a tasty canapé. 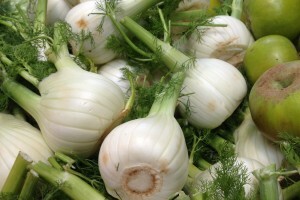 Add some dill to dress. A good substitute for crisps and salted nuts is to nibble on toasted almonds or mixed seeds instead. 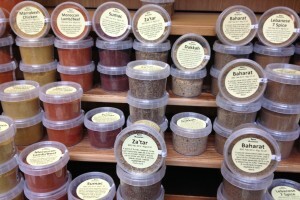 Try flavouring with spices such as tamari or paprika to make them more interesting. You can also use walnuts and pine nuts as toppings on salads or to add flavour to celery boats stuffed with low fat cream cheese. Sprinkle with pomegranate for a burst of colour. 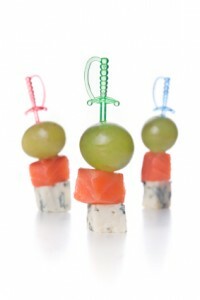 Fruit can also be fun to combine with cheese and vegetables – and the children love them. Whilst we are in nostalgic mood, why not reconstruct the grapefruit hedgehogs so popular back in the 70’s. Halve a grapefruit, lay flat side on the plate and create a hedgehog effect using fruit and cheese kebabs on cocktail sticks. You can experiment with all sorts of combinations, alternating cheeses (try grilled haloumi cubes or cheddar) with pineapple cubes, halved strawberries, red and green grapes and blueberries. If you want to add vegetables, cherry tomatoes and sweet pepper cubes also work well. 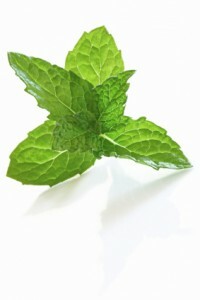 Mint and basil leaves also add colour, flavour and even more healthy nutrients. Don’t forget to add a non-alcoholic fruit punch to the party table. 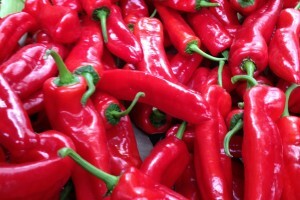 Another fantastic source of antioxidants and refreshing on a hot day. Let’s hope! Here are some suggestions below. Have a fun and healthy weekend!